I caught a lucky break with my spring cleaning challenge. The day after posting the challenge, I found a bookcase on the street while taking an early morning walk. My body hurt for about two days from lugging the bookcase to my building and then hefting it up three flights of stairs, but it did make the clean up easier. 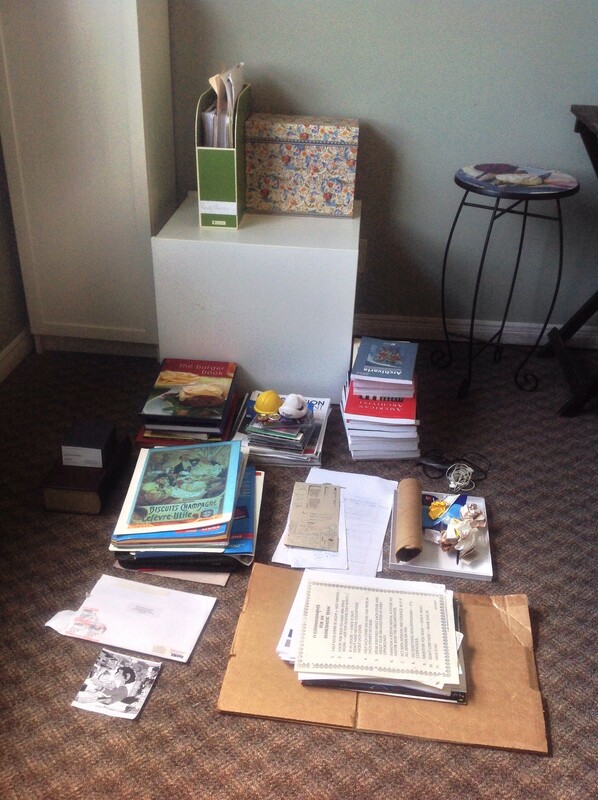 Like most clean-up projects, I started by sorting the items into piles: Donate, Keep, and Discard (Shred, Recycle, Toss). It sounds simple, but the Keep pile always gets a bit complicated. There’s always a curveball, meaning something random I want to keep that doesn’t fit anywhere. The piles starting from on top of the white box, moving down and then clockwise: green holder of professional reference materials, flower box of active client files, 3 piles of books and journals (donations), garbage, shred and recycling piles, stack of office supplies (folders, etc. ), 2 curve balls (comic and envelope of product samples), and 1 new project to organize all my business cards. I finally found a home for my professional reference materials and active client files. Score! I donated the contents of the green holder to make space for my professional reference materials. The outdated files in the flower box were shredded and replaced with new active files. 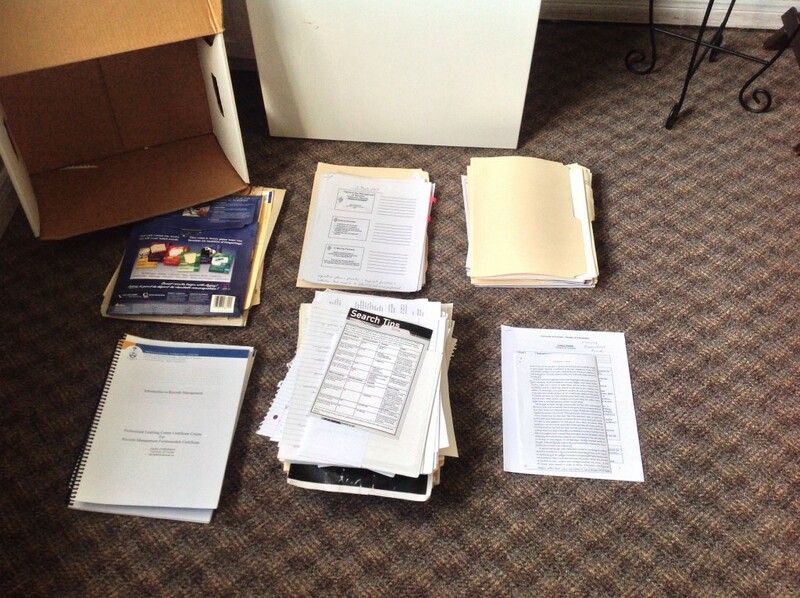 Still remaining was 1 banker’s box of school materials and a pile of teaching/training materials. 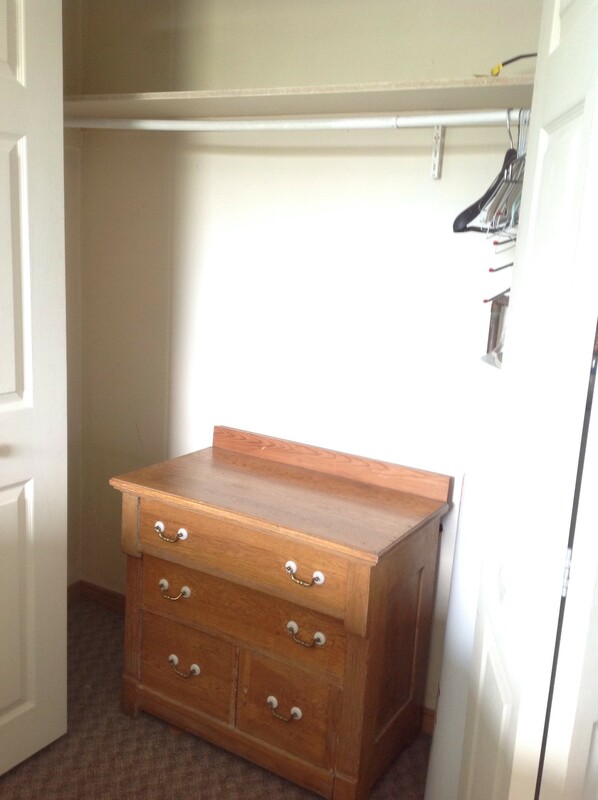 After the first push, this is what the closet looked like. I finished processing the first round of stuff, including all the books that went straight to the new bookcase. 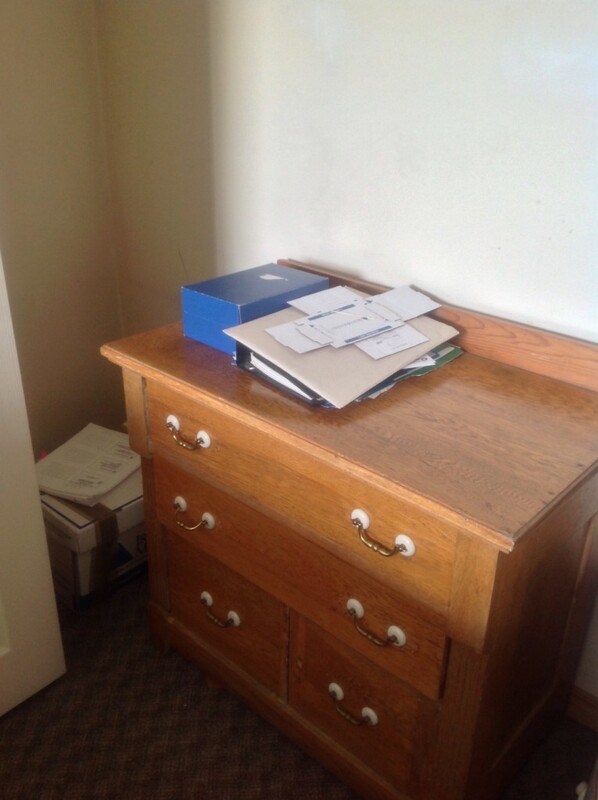 Then I tackled the second round, basically the banker’s box of *stuff*. I followed the same process and donated or recycled the majority of the contents. The piles starting from the top left clockwise: Office supplies, Professional Reference materials, Keep, Teaching Materials, Recycle, Return to Friend (I borrowed the booklets about two years ago). Finally, the closet and boxes are empty. There were definitely a few hard moments, like when I had to admit my erudite days of being a scholar were long gone and recycled or donated a lot of academic materials. Or when I pulled down a pile of papers containing my original birth certificate, a few other vital records and my two graduate degrees. Erp. Definitely not safe storage! Another hard moment came when I unearthed two boxes of business cards and carefully balanced it on top of my inbox as a future project. I hate it when I make more work for myself! As an added *bonus* I rented a car and took care of the donations right away, including a mound of stuff piled in my bedroom for months. I was able to donate many of the academic journals by posting a notice on a listserv. 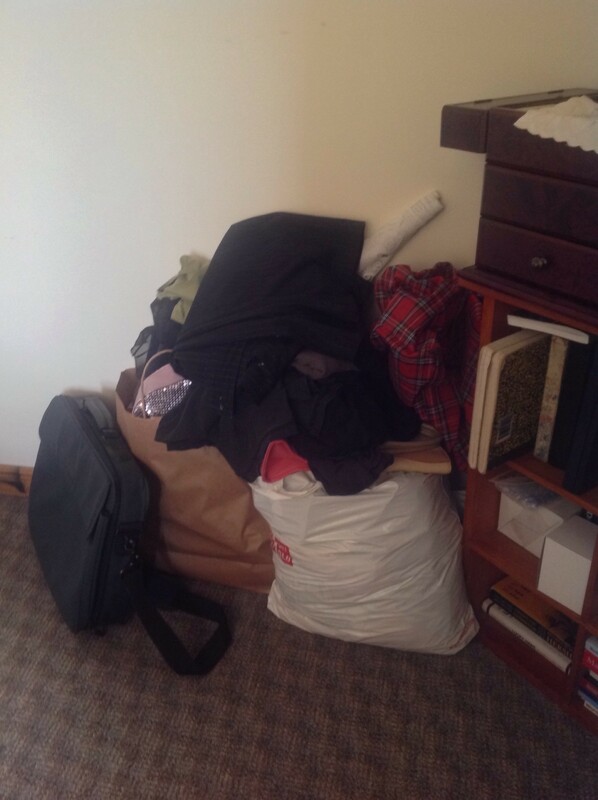 Pile of *stuff* waiting to be donated. Thanks to those of you who participated in the contest. I hope it provided some relief. I know I feel a lot “lighter”. Simply amazing to clean out. Liked your system of organizing different piles and ability to make a decision.